After a couple months up and running, a couple things have become clear at MPA: Loan originators have a lot to say, and put a lot of thought into saying it. Our forums have lit up over a variety of issues, with mortgage industry professionals offering opinions, advice or just some old-fashioned venting. With this in mind, we present MPA's inaugural Comment of the Week. I guess fear doesn't feel good when it's used against you. Banks, non-bank lenders, and mortgage brokers are all fantastic places to work, all with their pros and cons. The Dodd-Frank Act DOES require depository bank LOs to take equivalent education before and after their license. ^Hopefully Koss will learn that this year in his required CE class along with the broker and non-bank lender LOs---unless Executive Vice Presidents aren't required to take a CE class. Congratulations, Jillayne! 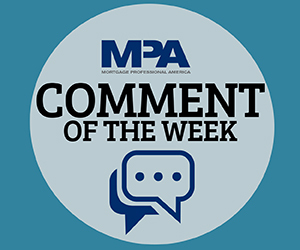 You've earned MPA's Comment of the Week! The reward, of course, is the respect and undying admiration of your peers.